Yesterday, Philip Rivers threw two interceptions. His team was down 21 to 3. By most accounts he and the Chargers were down and out. 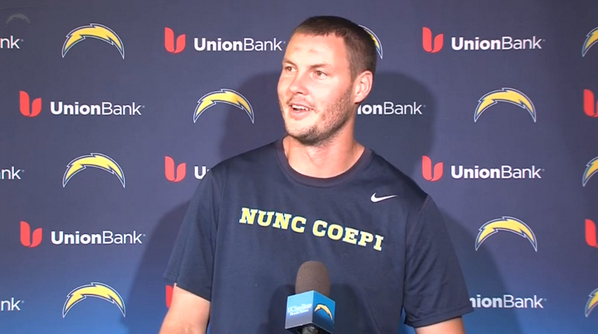 As a fan of both the San Diego Super Chargers and the faith of Philip Rivers, I firmly believe I know what he was thinking: Nunc Cœpi. I felt so strongly about this phrase, we adopted it as a team, and had it on t-shirts and on the walls throughout our practice facility. How did I find out about Rivers' fascination with this phrase? 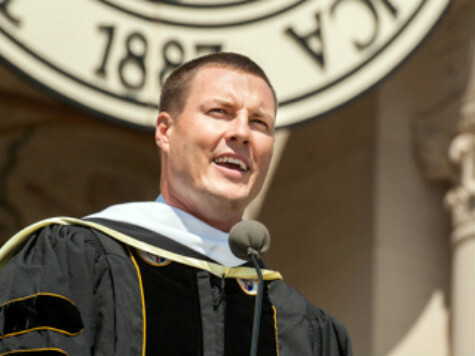 Well, last year, Rivers was invited to give the Commencement address at the Catholic University of America, and he shared with all present his thoughts about this phrase. Now I begin. In our prayer, in our habits, in our relationships, in our profession. It is applicable to everything. Nunc Coepi (Now I begin). Whether you made a bad grade or didn’t do so well on a project. You must begin again. When I have a bad play or a good play, whether I throw a touchdown or an interception, I must begin again. Nunc Coepi….it certainly applies to you graduates who now are beginning the next chapter in your lives. You now begin. But this is ongoing. You begin again, and again and again. You never give up. Nunc Coepi . Nunc Coepi. I can’t quite put the Latin twang on it. It’s more of an Alabama twang. But it gets the job done. 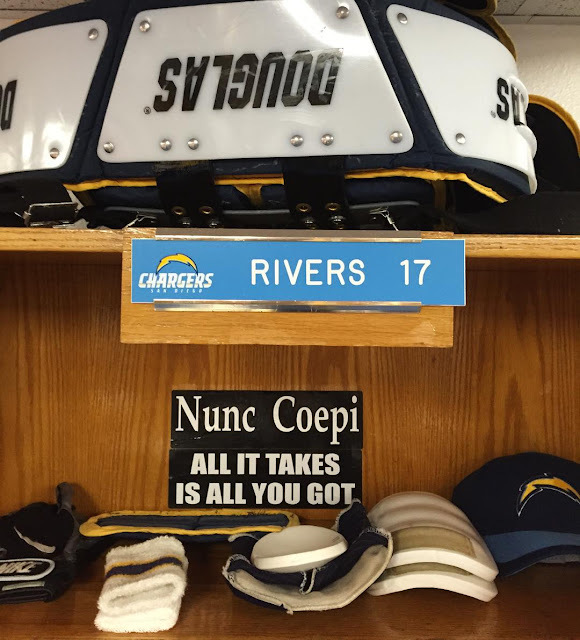 No matter where one is on his or her faith journey, it is fitting to say Nunc Coepi. If you haven't had a chance you can read the entire address here. I highly recommend. Or you can watch the video here. Oh, and just in case you missed it yesterday, after being in the hole 18 points, Philip Rivers led his team to 30 straight points and a 33-28 victory over the Lions. Nunc Coepi.